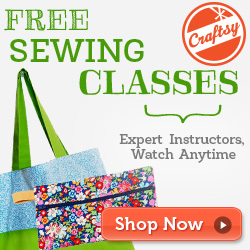 You can find many free sewing patterns online for all kinds of projects. Save yourself from buying high-priced sewing patterns at the local fabric and crafts store. Getting patterns from the web is the most economical way to sew. Consider using printable sewing patterns . These are patterns you can download from the Internet and print at home yourself. Visit my Burda Patterns page and find a link to free Burda Patterns online! Try searching for free patterns online. You will come accross plenty of ideas for that project you want to undertake. Why not take a look at these free sewing patterns from indie designers and choose a couple free sewing patterns at Craftsy! You’ll also find advice on how to do a certain project you have in mind, or even ideas for sewing projects you haven’t even considered. Scraps for Gifts – Making gifts from scraps of fabric found around the house can save you money, and is a great way to create and give presents. For example, from scraps of fabric you can create billfolds and wallets, purses, eyeglass cases, aprons , quilts, lunch bags, and hand towels just to name a few. Patterns for Pets – A great way to practice your sewing skills is to sew cute accessories for your pets. Making cat or dog blankets, beds, dog chew toys, and catnip mouse toys will keep your pets comfortable and active. Sewing such items for others’ pets will make the pet parents appreciative and happy. Kitchen Patterns – Sewing accessories to spruce up your kitchen gives you a sense of pride and accomplishment. Free sewing patterns available on the web include oven mitts, pot holders, hot pads, aprons, dish insulators, hand towels, appliance covers and curtains, plus many more items to add charm, color, and fun to your kitchen. Flag – A neat way to show your patriotic pride is to sew your own flag. It’s easy to do and many patterns with step-by-step instructions are readily available. Dress up the Car – A most fun way to sew for some people is to make accessories for the car such as a fur steering wheel cover, hanging fuzzy dice, shift knob covers, and car seat covers. Baby Blankets – A handmade baby blanket is a classic gift at baby showers. A mother-to-be would love a custom-made baby blanket from someone they care about because of its sentimental value. She would appreciate how it would keep her baby safe and warm. Cell Phone Case – Tried of dropping your cell phone or are you concerned by the news that you shouldn’t keep your cell phone in your pocket? Consider finding one of the easy-to-sew cell phone case patterns online. Sew a case for your cell phone that will not only protect it and you, but will add personality to your outfits. Mother's Day and Father's Day – Consider the many great patterns for the available for gifts such as a carpenter nail pouch, handbag, BBQ apron, snuggies, kitchen accessories, tool bag, and lounge pillows. Sewing can take a lot of time and patience, so study the free sewing patterns carefully before making any decisions. Many variations of the same thing are available for the projects you plan on doing, and finding the right patterns is definitely the place to start if you want to make high quality items that last for years to come. Sewing Patterns For Wedding Dresses - Find The Perfect Style For You! Kwik Sew Patterns - Unique Styles For The Whole Family!